partnering with long-time business associate and personal friend Cooper Friend, in their purchase of Green Mountain Harley-Davidson. Didn’t take long to triple its sales and the need to expand into a larger capacity building. In 2005, Dave and Cooper had the opportunity to purchase Schott’s Harley-Davidson located in Lewiston, Maine and the decision was made to split them into two stores (L-A Harley-Davidson & Central Maine Powersports). Taking the dealerships from 500 sold units to 1600 units in a short time. 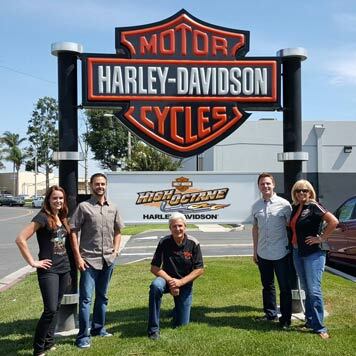 As 2018 kicked off, acquisitions of Six Bends Harley-Davidson in Fort Myers, Florida and Naples Harley-Davidson in Naples, Florida increased their presence in Florida to three locations. The growth and success of the dealerships couldn’t have been achieved without the help from our teams of outstanding employees. There are many Harley-Davidson dealerships out there that have big buildings and the exact same world class Harley-Davidson motorcycles, parts and MotorClothes. The only difference that sets our dealerships apart is the people. Exceptional employees delivering a premium customer experience creating customers for life is the key to our success! Step on our lot and you’ll notice more than our selection of over 500 new and pre-owned Harley-Davidson models. You’ll also experience the genuine love and passion that everyone on our staff shares for the Harley-Davidson nameplate. As a way of celebrating our excitement over America’s favorite motorcycle brand, we’re happy to sell a variety of Harley-Davidson gear and other memorabilia. Feel free to also be on the lookout for any of the 100+ family-friendly events we hold for the public to enjoy throughout the year. That’s not all we can do for you, though. We know how much it means to own a Harley-Davidson, which means you don’t want just anybody laying their hands on your hog. That’s why we’ve got a dedicated staff of serviceprofessionals to take care of all your maintenance, repairs, and parts needs. Whether you’re looking for a new Harley-Davidson, trying to find top-notch service for your current model, or just want to buy a shirt and talk motorcycles with one of the members of our team, we’d love for you to stop by any day of the week at 1 Chelmsford Road North in Billerica, MA.